Our sister company, Colorado Commercial Services (CCS), is a full-service property management company specializing in the management of all sectors of commercial property, including; retail, office, industrial and mixed use developments. At the request of our valued clients, Colorado Commercial Services was developed 7 years ago to meet the property management needs of the commercial marketplace. As a subsidiary of Resort Group, our history of managing properties & owners associations in Steamboat Springs dates back over 40 years. We work on behalf of the owners as a trustee, responsible for the financial and physical assets of the association. We employ sound fiscal and budgetary principles, and use detailed accounting systems to document all expenditures made for each association. We assist in developing long range plans for major maintenance and capital improvements that require both financial and logistical planning by working primarily with associations’ Boards of Directors on an ongoing basis, while also soliciting input from each individual homeowner. Click here to visit the Colorado Commercial Services website. 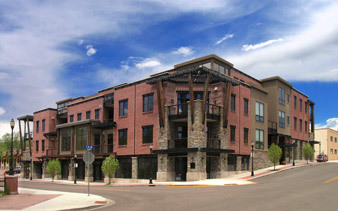 The Olympian in downtown Steamboat Springs is a 41,000 square feet real estate project of combined commercial and residential space.